I just finished reading “The Indus” subtitled “Lost Civilizations” by Andrew Robinson. 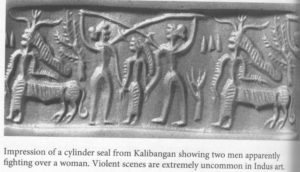 It is an enjoyable, readable overview of the Indus Valley Civilization (also called The Sarasvati-Sindhu Culture or SSC). The book covers the opinions of archaeologists who worked on-site as well as those of scholars trying to understand it. The Bibliography is reasonably comprehensive. In short, worth reading. Coming from a patriarchal, war-making, non-agricultural/urban cultural background, Robinson makes a set of easily-made-assumptions (which he inherits from Kenoyer). What’s the problem with this observation? Note that it is the ONLY image from SSC that seems to show a violent scene. A person immersed fully in a culture that expects to see violence will see violence. The long sticks are weapons. The men are fighting over a woman. The woman in the middle is holding hands with both men – they are pulling her in opposite directions. The victor will claim her as a trophy. She doesn’t choose, she is a mere object. Is it a surprise that a person from a patriarchal culture sees men fighting over a trophy woman. A second point: a person from a culture that has religion at the core of its ethos will see the creature to the right as a deity. He guesses that the deity has animal faces because the faces represent (unknown) powers or capabilities ascribed to the deity. Also, te deity must be mythical because ancient cultures have mythical deities looking like animals. Not like modern monotheistic man. Perhaps the last sentence is unfair criticism, because we know that many Bronze-Age cultures did have deities. But then … it must be that if one culture believes in deities all must because the concept of an anthropocentric and polyzoomorphic deity is such a compelling explanation for all natural phenomenon! There is a simpler explanation, one that I exploit in my novels based on the characters of the Mahabharata. 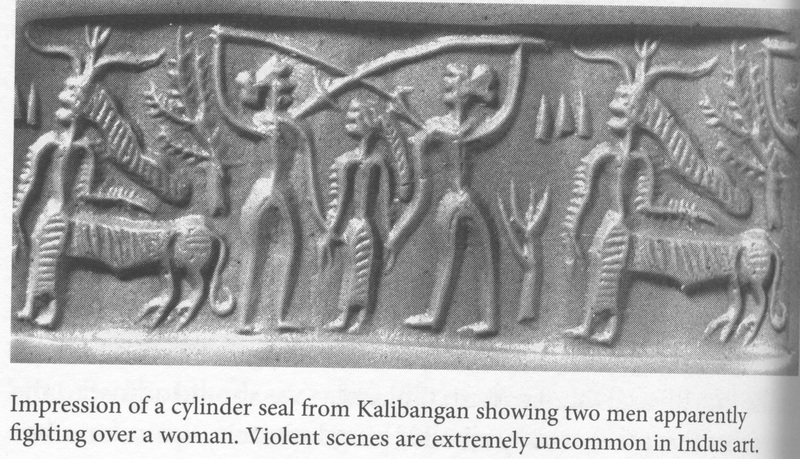 The seal portrays the men and woman performing a dance. The two men have formed an arch with sticks over the woman in the center. Note that the men are using opposite hands to hold the stick – this is what would happen in a “honor march”. Is there any reason to believe such an explanation? Yes, because such formations exist in the folk and court dances of many cultures. I can even point to a specific Scottish country dance, “The Triumph” which has a few steps with the woman in the middle, hands crossed in front and holding the two men’s inside hands, while the mens’ outside hands form an arch. Is there any reason to believe this explanation? Yes. The seal is (could be) a portrayal of a street performance, surely an unusual image to put on a seal. Maybe this was the seal of a performing troupe that was popular. That would explain an expensive seal of this size and quality. It is a one-of-kind seal — that may explain why only one such seal has been found. How about the creature to the right? Is there an explanation for that? Yes. Many folk-dance groups, particularly street performing groups, will dress one or two of their dancers as an animal, called a hobby-horse. The hobby-horse is responsible for “busking”, i.e., cajoling contributions from the audience. Hobby-horses come in many different forms – some traditional designs exist that are more common than others. In this case, two performers would make up the portrayed hobby-horse – a standing person in front who has the face and horns and sometimes dances to the music, while the second person is the body and rear end of the animal. We should be clear about something else – the people of SSC were not unfamiliar with war. Traders from the Indus Valley regularly came to Sumer for some centuries around 2000 B.C.E. They would have known about wars and it would have been easy [i]for an unscrupulous trader to bring or create an army and attempt to take over. There is no evidence of such an event – it appears that Indus Valley residents were not susceptible to temptation.